Graduated from Bogor Agricultural Institute, she has been working in the educational world especially for preschoolers since 2003. Besides her passion for teaching, she also enjoys activities such as singing, reading, baking and driving. Her first teaching career began by teaching Toddler and Kiddy level at Kinderfield Bogor. As she was promoted as Class Manager and Teacher Supervisor, she was given the opportunity to hold the position as Principal at Bogor Montessori School for Primary Level since 2010 until 2013. During those period of time, she enriched her Montessori skill by applying for Diploma Program through Distance Learning held by the North American Montessori Centre (NAMC) which based in Canada. She also has participated in various kinds of Montessori seminar and workshop. Her love and passion for Early Childhood Education becomes her main reason to join together here with us at Little Jamboree, besides her goals to build and teaches good values and characters as well as academic achievement to her pupils. Ms. Ossie started her teaching career in 2005. This alumni of the Management Degree at University of Pancasila loves to read, travel, listening to music, cooking and of course, teaching. Her desire to teach children drove her to leave her previous work as Human Resources staff at PT. Total Rocket. Based on her competence, she was believed to hold the position as Class Manager at Kinderfield Bogor until 2008. She was later given a new challenge and responsibility as Class Manager for Lower Primary Level at Bogor Montessori School. Her experience and passion has earned her the position as Principal for Preschool and Kindergarten Level at Bogor Montessori School from 2010 until 2012. She too actively participate in several Montessori seminars and workshops to enhanced her knowledge as an educator. Ms. Ossie joined the line-up of educators since June 2013 as a Coordinator of Curriculum Research and Development. She was teaching the Kindergarten Level from 2013 until 2014 as a Class Teacher. Now, she is actively teach Bahasa Indonesia for the Kindergarten. Ms. Eka or famously known as Ms. Ami started her career in the educational world as an administration staff at Bogor Montessori School since 2007 up until 2013 and finally joins Little Jamboree. During those period of time, she was actively works as a private mentor for preschool level. Her motherly demeanor and out-going personality makes children adore her. Our personnel who loves to read and enjoys swimming received her education at Kesatuan Management Academy, Bogor. To enrich her knowledge and experience, she also often participate at numerous In House training and group discussion held by Little Jamboree. Ms. Ami is now actively teaches the children in Playgroup level. Ms. Helen was born in Bogor and completed her study in English Literature at University of Pakuan, Bogor and currently is finishing up her Master Degree in the same university. Her interest in children’s world brings her to work as an educator for Early Childhood. She started her teaching career as an assistant teacher at Bogor Montessori School. Ms. Helen joined Little Jamboree since September 2013 and now is teaching the Kindergarten level. Before working in the education world, Ms. Janu worked as a reporter for News Division at Trans TV. After working for almost 5 years as a broadcaster, this alumni of Communication Degree at Atmajaya University in Yogyakarta decided to settle down in Bogor and follow what her heart’s desires the most which is teaching. 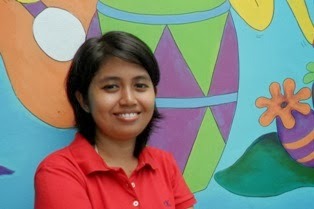 She started her teaching career as a teacher at Bogor Montessori School since 2010 up until 2012. She taught Primary and Preschool Level. During those period of time, she participated in several Montessori workshops and seminars as well as one of the NAMC Distance Learning participant. In 2013, for one Academic Year, she spent her time working as a part time playgroup teacher at Regina Pacis School, Bogor. Ms. Janu has joined Little Jamboree since June 2013. She is currently holds the position as an administrator. This native Bandung female join Little Jamboree since June 2013. Alumni of Secretary Program at Santa Lusia Secretarial School is still completing her study at Open University majoring in Management. Our assistant teacher, Ms. Cindy has joined Little Jamboree since December 2014. She is a college student and currently in semester 8 in STIE Kesatuan Bogor, majoring Finance Management. Her character as a friendly, kind and humorous person enable her to adapt in any kind of ages and situation. She loves everything about music and able to play the piano well enough. She is fascinated by Korean culture from songs, words and movies. One thing for sure, she loves children, she is eager to learn lots of things to fulfill her knowledge about children. This alumni of English Literature from Pakuan University has become a teacher in Little Jamboree since 2015. Watching movies, listening to music, and reading are some of her hobbies. Miss Remy started her career in Kinderfield as a teacher in Playgroup level. Her interest in Childhood Education makes her set her heart to become a teacher up until now. This Korean culture enthusiast is now an assistant teacher in Kindergarten level. Miss Ari starts her carrier in educational world for preschoolers level since 2003 as a teacher in Kinderfield. She then continue her teaching experience as a teacher in Intercultural School of Bogor (ISB) from 2007 up to 2014. She was graduated from Nasional University majoring in Tourism. However, because of her love for the world of education for children, especially in Early Childhood Education, she established herself to be a teacher up until now. Her hobbies are travelling, reading and cooking. Miss Ari has become Little Jamboree's teacher since 2015 and for now she is teaching in Kindergarten level. Miss Wini started her career as Administration Staff and Front Officer since 2000. This cheerful alumni of Economic Management of STIE Triguna had left her previous career as an Admistration Staff in STIE Triguna Bogor to become Little Jamboree's Administration Staff in November 2016. Miss Wini will be happy to help you with all of the administrative things and information.